Although, she did not bargain for it, but a woman who couldn’t conceive 10 years after marriage was shell-shocked as gets fruits of the womb five times in one fell- quintuplets in her first and only pregnancy in a decade. So, was the case of Mrs Ekpo Edet, a civil servant in Cross River State civil service, who recently gave birth to five bouncing babies consisting of three males and two females at the University of Calabar Teaching Hospital (UCTH), Calabar. Despite the daunting challenge of nursing five babies in a harsh economy, the middle-aged mother and administrative officer had since accepted her fate, describing the babies as marvelous and previous gifts from God. Mrs. Ekpo disclosed that she didn’t pray to have quintuplets, but has a family tree that has a record of a delivery of a twin babies. She said at that conception she was only interested in having just a baby, and not babies, especially having been unable to have one after 10 years of marriage. 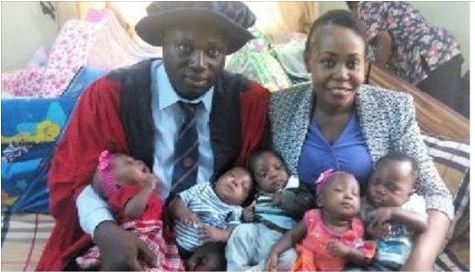 However, after the successful delivery of her babies, Ekpo noted that she, alongside her husband, Dr. Edet Effiong Ekpo, had been full of praises to God Almighty for blessing them with a set of quintuplets, after waiting upon God over the past 10 years, amidst persecution from different quarters that demand a child from her. Mrs Ekpo told our correspondent that her greatest challenge in bringing up the babies at the moment was that of finance, but expressed confidence that God will always cater for them. In view of the prevailing economic hardship and the enormous tasks of catering for the needs of five babies at a time, Ekpo doesn’t wish to have another set of quintuplets. According to her, “It was marvelous having those babies. Even though I didn’t pray for it, and it just came, I give God the praise. But I wouldn’t want to have another experience. I won’t. The stress is much with this present economic situation. I won’t. Remember that we are all civil servants. I don’t have help from anywhere, except God. Ekpo, who expressed satisfaction over her post and ante-natal and post-natal medical care, used the opportunity to advise pregnant women to always adhere to the instruction and prescriptions of their doctors in order to experience a safe delivery. She specifically commended Prof. Davies Ekanem, of the UCTH, for his medical care before and after her delivery. Nevertheless, she narrated how she had a high blood pressure due to anxiety on the day of delivery, but said God took control of the situation. Has any woman in her lineage had multiple births? She says, “Actually, my mom’s elder sister had twins.” In spite of the huge financial implications of catering for the children, all had been well with the mother and her “five bundles of joy” health wise. “Since after delivery, I have not had any course to take them to the hospital, though I treat them of malaria, every two month. In the course of all these things, I never had high BP, except on the day of delivery, my BP rose a little out of anxiety. I was scared as a human being. But, in the whole, we all have not had any health issue, so far. We are hale and hearty,” she said.